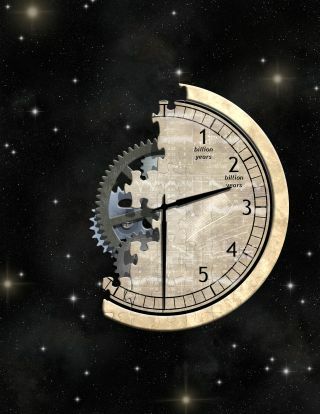 This artist's impression of a "cosmic clock" illustrates how astronomers have used stellar rotation to measure the ages of stars in a 2.5-billion-year-old star cluster. Using NASA's planet-hunting Kepler spacecraft, scientists have refined their ability to nail down the ages of individual stars by measuring the objects' mass and how quickly they rotate. "Our goal is to construct a clock that can measure accurate and precise ages of stars from their spins," lead author Soren Meibom, of the Harvard-Smithsonian Center for Astrophysics (CfA), said in a statement. The new findings were presented at a press conference during the 225th winter meeting of the American Astronomical Society (AAS) last week in Seattle. Determining the age of a star isn't as simple as counting the candles on its birthday cake. But understanding stellar age is crucial in determining how astronomical phenomena involving stars and their companionsprogress over time. It's easier to tell the age of a young star because they rotate more quickly and have larger starspots. One way to determine the age of a star is by calculating how quickly it spins. Over time, the rotation of a star slows steadily. How swiftly it turns is also related to its mass; larger, heavier stars spin faster than smaller, lighter ones. Meibom and his colleagues discovered close relationships among mass, spin and age. By measuring the first two attributes, scientists can determine the third, study team members said. "We have found that the relationship between mass, rotation rate and age is now defined well enough by observations that we can obtain the ages of individual stars to within 10 percent," co-author Sydney Barnes, of the Leibniz Institute for Astrophysics in Germany, said in the same statement. In 2003, Barnes proposed the method of correlating the three characteristics, calling it "gyrochronology" from the Greek words "gyros" (rotation), "chronos" (time or age) and "logos" (study). In addition to helping scientists understand astronomical processes, learning the age of a star can also aid in the search for life beyond the solar system, researchers said. It took several billion years for complex life to develop on Earth. An accurate stellar clock allows scientists to identify planet-hosting stars as old as, or older than, the sun. Like sunspots on the sun, distant stars host dark spots on their surface known as starspots. These markings travel across the stars as they rotate, causing a slight dimming in the light the stars produce. While sunspots are relatively easy to measure from Earth, stars remain bright points of light, so their starspots aren't directly visible. Instead, astronomers watch for the star to dim slightly as a spot crosses its surface, then brighten again as the sunspot rotates off the visible surface. The changes in brightness can be a challenge to detect. On average, a star dims by less than 1 percent, and starspots can take days to move across the surface, researchers said. It's harder to tell the age of an older star because they rotate more slowly and have smaller starspots. face of their host stars. Kepler's observations of stellar brightness allowed the team to make precise measurements to refine their calculations. To measure the links among the three characteristics, the team pointed Keplerat stars with previously calculated ages to determine the objects' spin rates. In previous work, the scientists had studied a cluster of billion-year-old stars; the new study targeted NGC 6819, a 2.5-billion-year-old cluster, significantly improving the stellar age range of stars in the study. "Older stars have fewer and smaller spots, making their periods harder to detect," Meibom said. The team targeted 30 stars that harbored from 80 to 140 percent of the mass of the sun. Their spins varied from 4 to 23 days, compared to the 26-day rotation of the sun. The eight stars from NGC 6819 that bear the strongest resemblance to the sun have an average spin of 18.2 days, suggesting that Earth's star had a similar rotation 2 billion years ago, when it was 2.5 billion years old. The team then determined which of several existing computer models that calculated the spin of stars based on their masses and ages best matched the researchers' observations. "Now we can derive precise ages for large numbers of cool field stars in our galaxy by measuring their spin periods," Meibom said. "This is an important new tool for astronomers studying the evolution of stars and their companions, and one that can help identify planets old enough for complex life to have evolved." In addition to being presented at AAS, the new study was published online in the journal Nature.